Season Wrap Up: What do we do now? Eb-dee eb-dee eb-dee ebdee- That’s ALL FOLKS! The last day of the Alpine Southwest tour through the San Juan Mountains of Colorado brought an end to another wonderful hiking season in the U.S. and Europe. 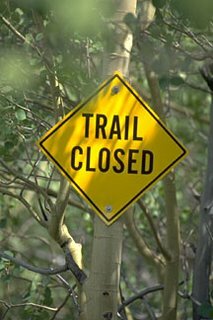 Of course, we’ll continue to hike in our spare time, but the guided hiking season at Ryder-Walker is now officially closed for 2006. However, our self-guided travelers continue to hike through Switzerland and a few won’t even return until the end of October. Gasp! Isn’t October a little late for the Alps? Yes it is, and we wish our travelers luck. In point of fact, the Engadine region of eastern Switzerland offers many options at lower elevation that typically remain snow free until late in the month. Therefore, we still have time to organize a last minute self-guided tour through the Engadine for anyone who’s interested. Please be advised though, that many of the high passes may be closed because of inclement weather. Please contact Ryder-Walker for more information.